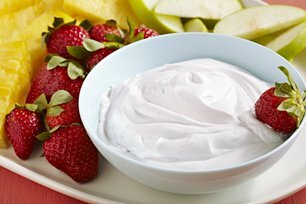 Fresh fruit tastes even better when it’s dipped into this easy, refreshing blend of raspberry yogurt and whipped topping. Prepare using your favourite flavour of low fat yogurt. Serve with cut-up fresh fruit. This oh-so-easy dip can be prepared ahead of time. Refrigerate up to 12 hours before serving.